US manufacturer defends its patents against Canadian import. On July 11, 2015, Brock International filed a lawsuit asserting six United States Patents on turf underlayment systems against Nexxfield, Inc., based on Nexxfield’s NexxPAD shock pad for artificial turf. Brock has commercialized the patents in its successful Performance Base® F Series, PowerBase® Pro and PowerBase® YSR products. A United States Patent gives its owner the right to prevent the unauthorized manufacture, use, offer for sale, sale and importation of the patented inventions in the United States. Civil Action No. 1:16-cv-07135(N.D. III) filed in the U.S. District Court for the Northern District of Illinois in Chicago claims Brock has not authorized Nexxfield or its affiliates or customers to manufacture, use, offer for sale, sell or import the shock pad designs, such as the NexxPAD, that are covered by Brock’s patents. Polypropylene is a durable, high performance material when properly engineered for use as a shock pad under artificial turf. The use of shock pads under artificial turf has more than doubled in the past several years as clients understand the long term safety benefits for the players. Brock’s patented Performance Base F Series, Powerbase Pro and PowerBase YSR products have set the standard for safety and performance, along with warranties and guarantees unmatched in the industry. Extensive, real world testing on hundreds of fields has proven artificial turf with a Brock shock pad significantly reduces GMax, maintains field stiffness under foot and improves Critical Fall Height to levels that mimic pristine natural turf, the ultimate goal of any artificial turf surface. 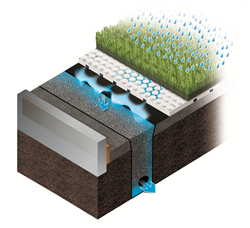 Brock International is the global leader in performance base systems for synthetic turf. With hundreds of fields, ranging from the NFL and NCAA to Schools and parks across 19 countries, the company engineers the best, safest and most sustainable playing surfaces in the world for athletes at all levels. Brock is an Official Education Partner of The Concussion Legacy Foundation, a Boston-based non-profit organization founded to advance the study, treatment, and prevention of brain trauma in athletes and other at-risk groups. In October 2011, Brock became the first company in the industry to have a Cradle-to-Cradle Certification CM for its combined drainage and shock pad product.